What an amazing idea. I wish I had known about his event so that I could have stopped by for the day. I will definitely be keeping an eye out for the next event. 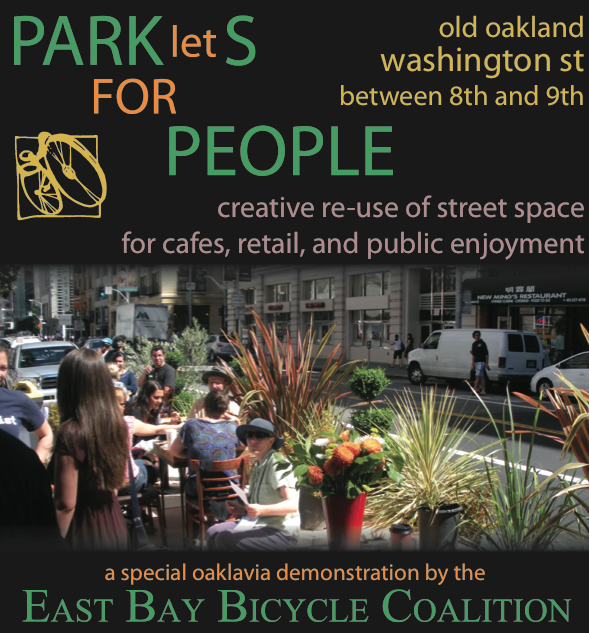 I think that it is amazing that the city of Oakland is allowing people to put on events such as this one. If you want to see a video covering parts of the event, click on the link for Walk Oakland Bike Oakland below and scroll down. “Parking downtown is often frustrating, but one driver looking for parking near the bar Penelope on 12th Street must have been especially confused Friday, when he found the last spot on the block taken—not by another car, but by a couch and a makeshift coffee table, on top of a bright green swath of Astroturf. With the help of Penelope and five other local businesses, cycling advocates celebrated PARK(ing) Day on Friday by converting parking spaces like the one on 12th Street into tiny parks—all while feeding the meter, of course. The temporary green spaces, or “parklets,” which sprang up on streets in Oakland and other cities around the world, were meant to show what cities might look like with more space for people and less for cars. via What’s that park doing in my parking spot? – Oakland North — North Oakland News, Food, Art and Events.. In our globally connected world, some things are lost in translation. But, perhaps, not all things. In a delightfully expressive commentary on the wisdom of using Android, Nokia’s outgoing chief smartphone person, Anssi Vanjoki, declared that those who use Android are, philosophically speaking, “peeing in their pants” like Finnish boys do to keep warm. via Nokia exec: Using Android like ‘peeing in your pants’ for warmth | Technically Incorrect – CNET News. These are tumultuous times for the LGBT community. DADT repeal falls flat this week, but then the 3rd District Cour of Appeals upholds the 2008 decision to overturn the ban on adoption by gay people. Will this be yet another LGBT case on the way to the Supreme Court? (Miami) Florida’s strict ban on adoption by gay people is unconstitutional because no other group, even people with criminal backgrounds, are singled out for a flat prohibition by state law, an appeals court ruled Wednesday. The ruling by the 3rd District Court of Appeal upholds a 2008 decision by a Miami-Dade County judge who found “no rational basis” for the ban when she approved the adoption of two young brothers by Martin Gill and his male partner. The prohibition was first enacted in 1977 and is the only law of its kind in the nation, according to court records. via Court affirms overturning Fla. gay adoption ban | News Story on 365gay.com.